Home / So much fun! Another fun weekend at the Beehive! YAY! 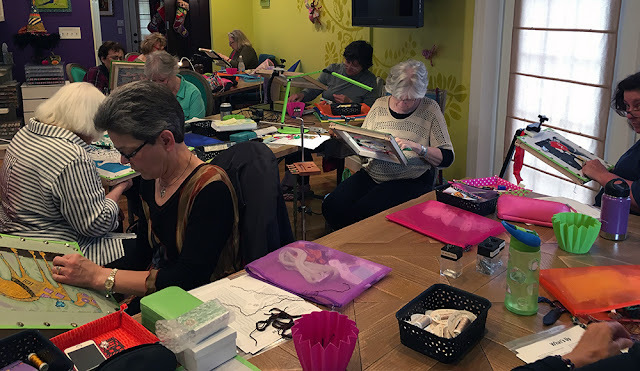 The beehive is the studio and office for Bedecked and Beadazzled and it is a great space. Lots of room for spreading out and creating magic. We had a full house with 10 people in class! 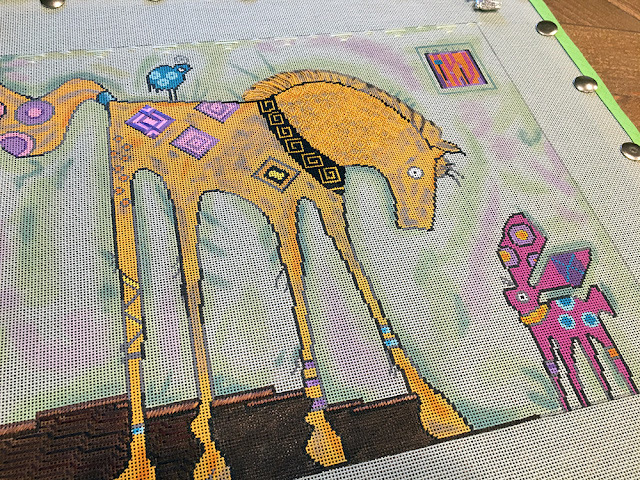 I am very lucky that you trust me with your canvases and allow me guide you on this journey of threads and stitches. 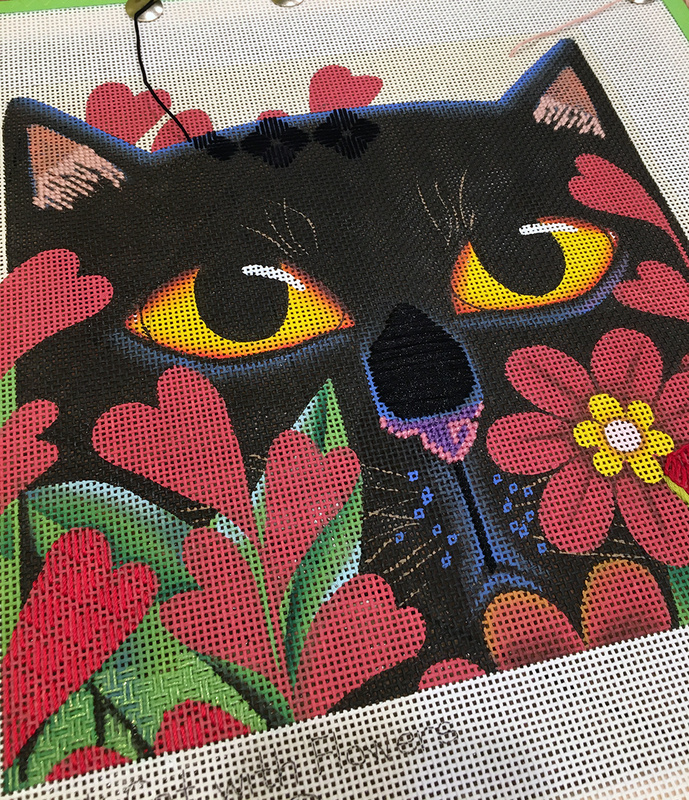 The black cat with flowers is all about puns. 🙂 He’s a cat in flowers so he should be stitched in a flower pattern. And the flowers are shaped like hearts to they should have hearts on them, right? I was being silly, but he is awfully cute. 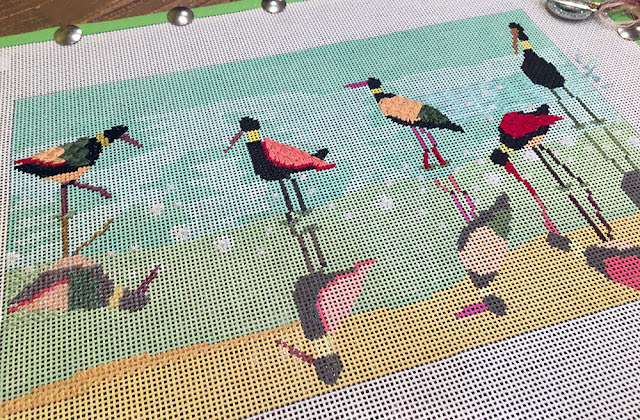 The deco detective is so graphic and has lots of fun stitches. 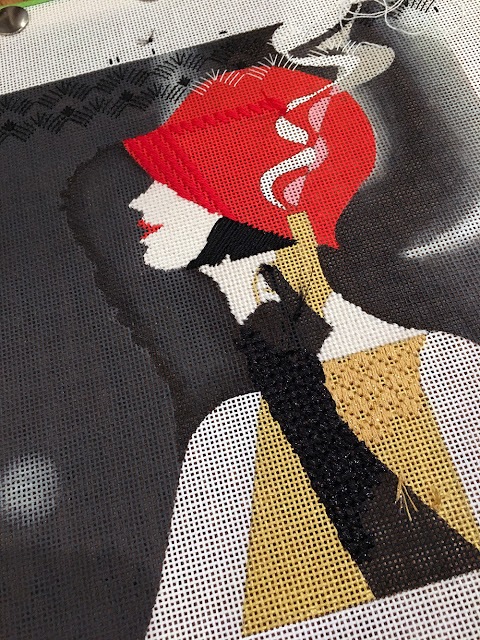 A brand new deco background and a sparkly dress that will have beads! 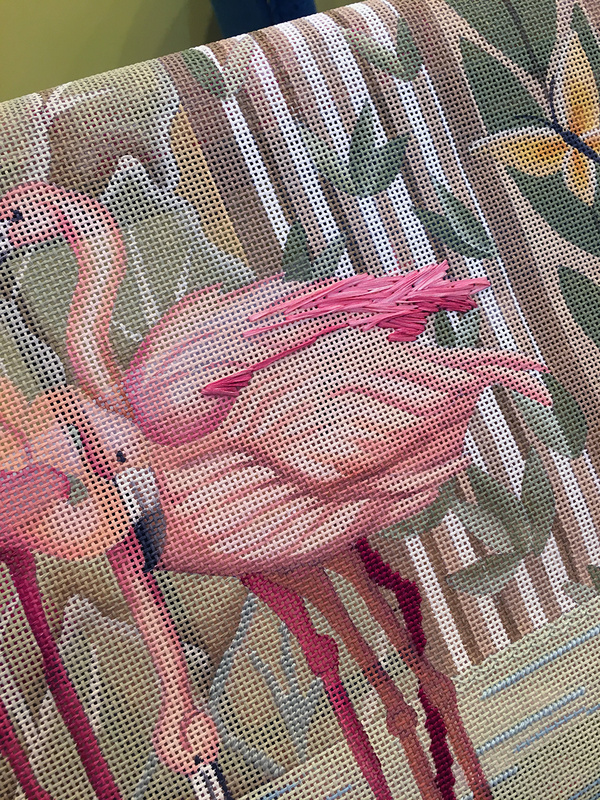 Melissa Shirley’s flamingos are huge! But they are painted on 13ct so that is a huge plus. 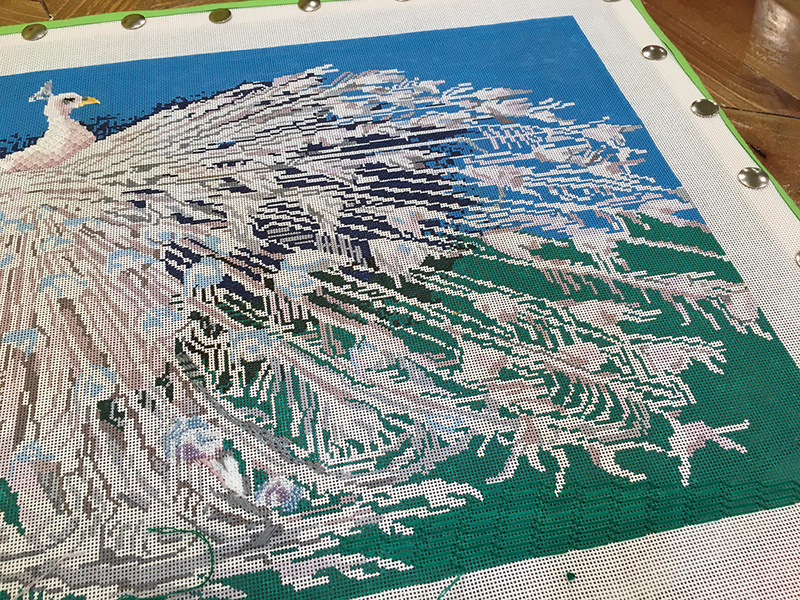 Straw Silk is making wonderful feathers. 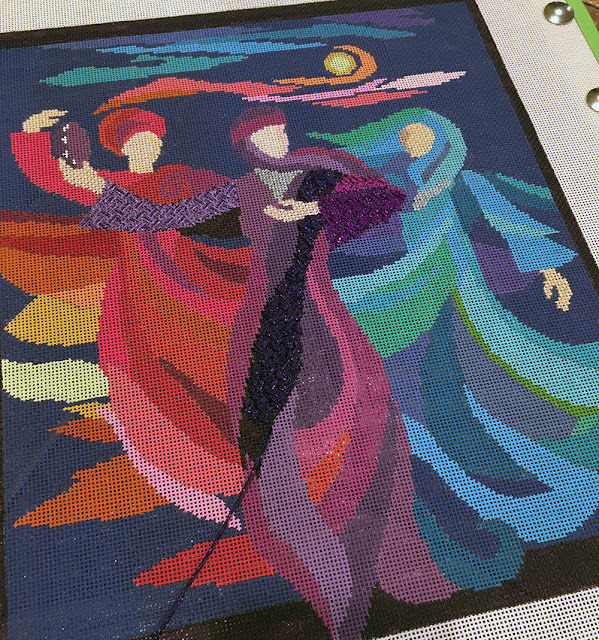 The Dancing Miriam canvas is a veritable rainbow of threads. I love this canvas. It’s funky and fun but it still has an air of elegance. 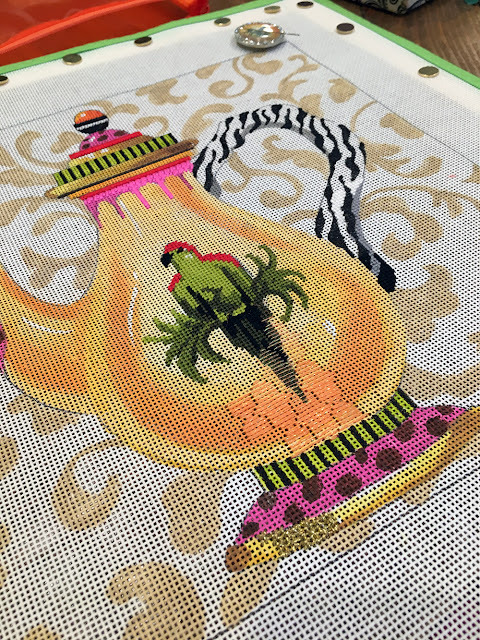 It needs lots of open stitches so that the paint shows through. That is after all why we love it. A darning pattern will be just the right touch in the background. Just a little bit of padding and his mouth starts to come forward munching on the leaves. 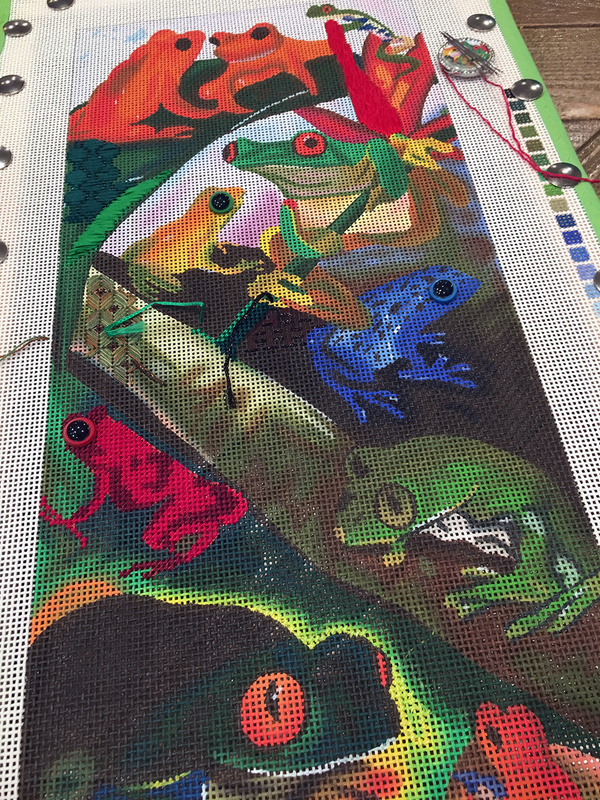 Tree frogs! Check out the eyes on the three in the middle. They really bring the canvas to life. It’s all about the shading and the glossy finish on the teapot. Yes, there will be a few beads. Can you see the bird on the left’s reflection in the water? Splish splash. This will be a painterly masterpiece when it’s finished. It’s all about the placement of beads and tiny stitches throughout the feathers…..
We are happy to kit any of these canvases for you, or simply supply the guide if you already have the canvas. 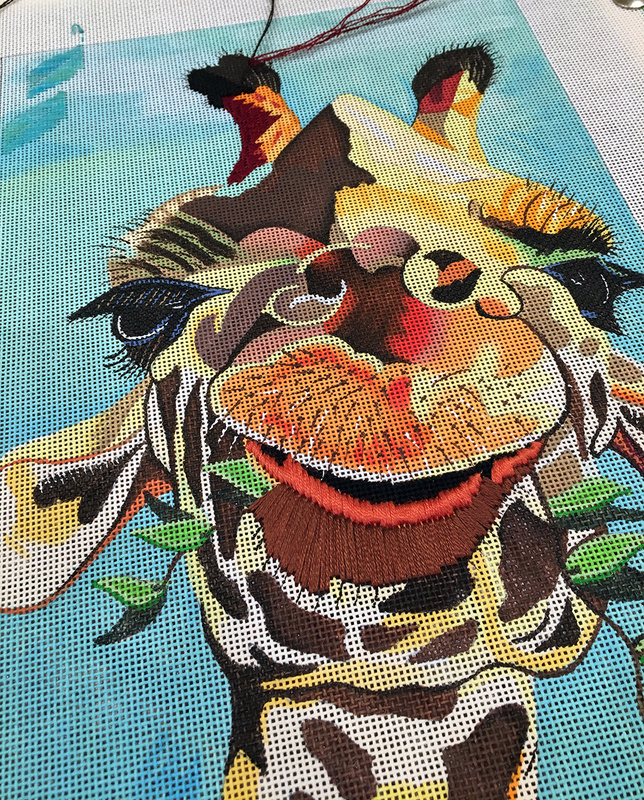 We hope you will consider joining us for a future embellishment extravaganza. They are oodles of fun. Next class is January 7 & 8, 2017. Spaces are filling quickly.